When Nina Davuluri won the Miss America pageant on Sunday, the celebrations were marred, shockingly, by some hate tweets, and as some view it, racist comments. Obviously, those comments led to more hatred against the haters on social media. And, surely, this morning’s newspapers in India led with Davuluri’s crowning on Page 1, playing up, alongside with the young lady’s triumph, the misplaced hatred for and racist comments against her. That brings us to a simple yet important question: why do we hate someone or something? To be sure, each of us is strongly opinionated. Some of us express ourselves rabidly – of late on social media – while others keep their views to themselves. But, without doubt, we have experienced hatred for someone, whom we cannot get along with (often not even stand the sight of) at some time or the other. The question is why? The fundamental reason why we hate is because we are not aware of the oneness of all creation. It is when we see each person as different from ourselves do we even have the urge or temperament to compare, and therefore, to dislike, or in some cases, hate. Separateness comes from the ego. When the ego is driving you not to look at the core of your creation, but at the fringes – when you look at nationality, community, family background, social or economic standing, color and such. Instead look at the core of all creation – especially among us humans – you will find that there is no separation, no difference. All of us are alive because of the same Life source powering us. We may have different stories, different upbringings, different education, different approaches to Life and even speak different languages – but we are all one! An evolved person will not let the ego drive her or his Life. Such a person will look beyond the differences, and go to the core and celebrate it. Then Davuluri’s win is your own win. As much as the loss of lives in the Washington D.C naval base shoot-out is your own loss. The more we see creation as separate, the more we will be consumed by such wasteful emotions like hatred. At least one intelligent response when you see a chain of hatred being triggered is not to participate, not to respond. Just let it go. One opinion less out there means one moment less in the public lifetime of that form of hatefulness. By choosing to stay away from joining the chain of hatred in a situation does not mean ignoring it or “brushing things under the carpet”. When you feel hatred towards someone or something, focus all your attention on it. Don’t respond to it. But deeply meditate on it. You will then see the futility of your anger, the stupidity of your opinion, the frivolity of your venom, your hatred and through your ‘seeing’, you will see the object of your hate and you as one! It may sound incredible. But try meditating on someone you hate and you will come to this realization soon – perhaps after a few attempts owing to the “extent” of your hatred and your own evolution with the practice of meditation! The truth is, as the Buddha taught, either you – the real you – exists or hatred does. 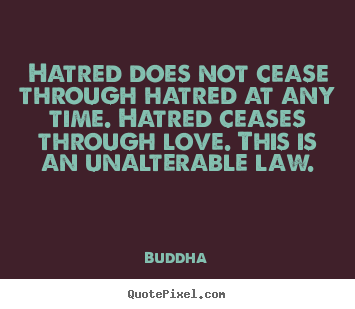 If hatred is, then you are not. And if you are, then there can be no hatred. The real you, the real me, get suppressed when we are not aware, when we are in the clutches of ego. The moment awareness takes over, the ego cannot survive. And when there is no ego, there’s no hatred, there’s no separateness. Only oneness thrives!